An interesting take on a situation from world war II between the germans and russians and two opposing snipers out on the hunt for each other. Enemy At The Gates is a different kind of World War II movie. that’s not to say that it’s like the hurt locker is to the middle east, which means a movie that doesn’t even get into politics at all. it’s just to say that unlike most world war II movies which feature america, in Enemy At The Gates, the united states is nowhere to be found. we don’t even hear about the u.s. in the background. and that’s a little strange considering every other movie on this topic, from saving private ryan to inglorious basterds, somehow has americans in it. that happens to be one of the many reasons why this movie is pretty cool. the movie is about Russia vs. Germany. specifically, about the city of stalingrad in russia, which became a major battle zone and really the turn around point of the war. Most people don’t know the history of all this, but the fact is stalingrad was the first set back that hitler’s nazi forces faced. one year afterwards, the united states was taking italy, and the war was nearing it’s end. and two years afterwards, the u.s. stormed normandy beach for d day. but this movie isn’t about all that. it’s not about how hitler assumed the soviets were helping the british (when really it was us), and so he turned on his soviet allies. it’s not even really about germany vs. russia. We never see hitler, for example. instead, the movie is about two snipers. it’s about how the russian forces in stalingrad needed to believe that a miracle was possible, and so one newspaper writer came up with the idea to make a hero out of an ordinary soldier with good marksmanship. the newspaper writer is commisar danilov (joseph fiennes), and he meets our hero, vasili (jude law), early on. the movie opens with a scene that ends up turning into this meeting. the scene is a huge run through the grimy and explosive filled land of stalingrad. men take boats across a river and while on those boats, german fighter planes fly overhead, shooting at them. many men jump off of the boats and into the water. it’s impossible not to think of saving private ryan’s opening beach at omaha during a scene like this. especially when the men get off the boats and start running. only one in every two men is given a rifle and the orders are that if the man in front of you is shot, then you should take the rifle and keep going. it is a long and intense sequence, just like the saving private ryan omaha beach one was. and by the end of it, the germans have pretty much killed all of the russians. except for vasili. he lies in a pile of dead bodies, and when danilov ends up driving through, crashing, and hiding in the bodies as well, the two men meet. that’s when vasili ends up taking a rifle and picking off as many german soldiers as he can see. and that’s when danilov realizes that he’s in the presence of greatness. pretty soon he’s reporting to krushchev (bob hoskins), the leader of the soviets stationed in stalingrad, telling him all about this vasili. and that’s when the newspaper articles start being written. pretty soon germany is sending out their own sniper with the mission to take out this vasili who is inspiring the soviets and allowing them to think that they have a chance. apparently every day vasili goes after and kills more and more german officers of high rank. i would have liked to see that. 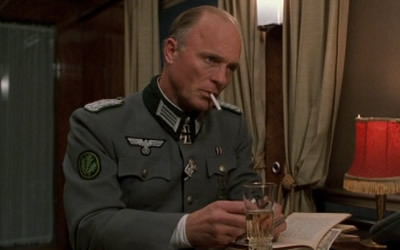 it seems that once the german sniper, major konig (ed harris), is sent after him that becomes what the entire rest of the movie is about. it would have been cool to get a few scenes of vasili crossing off names from a list, kill bill style, as he took out his targets. The first half of the movie is all about vasili becoming this hero and getting this reputation. the second half of the film is really all about his battle of major konig. the casting of that villain is right on the money, with ed harris completely immersing himself in the role, and it’s really this cat and mouse stuff that makes the movie, but still it feels like just too much of the same. 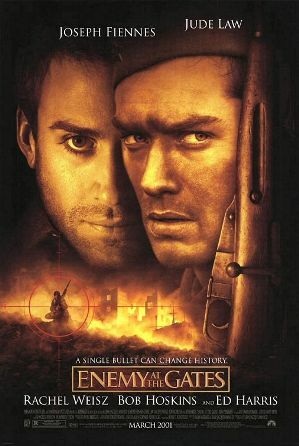 if you want a movie about two snipers going at it, than this is the perfect film. the historical setting just adds to the intensity. but it’s almost not enough for one movie. there seems to be no other plot line besides this. sure, we get other characters, like tania, played by rachel weisz. she’s the girl who danilov falls for and then vasili steals away from him. but that storyline never really goes anywhere all that interesting. the movie is definitely cool in the way that it is different from most other films set in this time period and sort of setting. it’s also pretty neat how the two men take each other on. but being a sniper isn’t exactly like being james bond. most of the job is just lying around waiting for something to happen. like cops on a stake-out. the action is pretty good here, and the i like the subplot involving a little boy who gets mixed up between the two enemies, but the movie definitely drags at times. it’s hard to make a movie about guys who do this line of work and not have it ever get slow. and the dark and gritty setting doesn’t help. still it is a very original movie and definitely filled with cool ideas.